Today I want to talk about fungus. Something I use a lot for so many different reasons it is just silly. Mushrooms range from having very little flavor of their own, like white button mushrooms, to some that are earthy or taste downright meaty, like Portobello or Shiitake. I like stuffing big ones with what could otherwise go in a sandwich or pizza, like my Portobello Pizza, or use them to fill out the volume of dish, like my Chicken Faux Fried Rice. One thing that comes up sometimes is how to clean mushrooms. I never come home with them and drop them in water to get the dirt off, but I do rinse them with water right before I use them. Some people think that rinsing with water is mushroom blasphemy and do nothing more than wipe them with a towel or lightly brush them. You see, mushrooms are like sponges. Whether it is plain water or broth or tomato sauce, they soak up liquid that gets in contact with them. If you soak them or rinse them in water too far in advance of using them in a dish they can absorb the water and dilute instead of enhance. I only rinse them right before using them, so never had a problem with waterlogged ‘shrooms. They are also powerful vehicles for other flavors. Just like they absorb water, other liquids are soaked up by them as well. I often use milder white button mushrooms when I want them to take on other flavors, like in soup or tomato sauces. If I want them to stand more on their own I will go for the earthier, meatier types of mushrooms. This particular batch of soup had some texture, since I puréed instead of strained the base. I also wanted to let the flavors of the non-mushroom vegetables and the goat cheese shine, so I used the white button mushrooms. Little B liked it until she found a piece of mushroom slice, then, in her words, it was suddenly “not my favorite.” That’s okay. More for me and Big D! Immediately before making the soup, rinse dirt off mushrooms with cold water and leave them out to dry. Remove stems from all the mushrooms. Slice mushroom caps and set aside. Roughly chop up stems. Melt butter in medium sauce pot over medium high heat. When butter is bubbling add green onions, yellow onion, garlic, carrots and parsley. Cook until onions begin to brown. Add the chopped mushroom stems, salt and pepper. Stir occasionally and continue cooking until mushrooms shrink and release their liquid, about five minutes. Add broth, turn heat to low, cover and let simmer for ten minutes. For smooth soup, pour the cooked mixture through a sieve and discard vegetable chunks. For chunkier soup, purée vegetables with immersion blender, food processor or stand blender. Return liquid to sauce pot over medium low heat. Add goat cheese and sour cream, stirring occasionally until cream and cheese is melted and incorporated while the soup heats up again. Add sliced mushroom caps to pot, stir and then cover. Reduce heat to low, reducing heat further if necessary to make sure the soup does not boil. Continue simmering for 20 minutes. Turn off heat and let sit for a few minutes until it soup is cool enough to eat, adding more salt to taste if needed. Although it is still in the mid-80s and humid here in Texas, my time on the back porch on cool mornings has given me a hankering for chicken soup. After consulting Little B on the contents she desired, specifically apples, I was inspired to tweak a previous snappy and successful chicken soup recipe to honor autumn with apples and some root vegetables. It was a great way to use the meat and juices from half a spatchcocked chicken. The apple, corn and carrot gave the soup a pleasant sweetness while warming and filling our bellies. This soup can also be made with a traditionally roasted chicken and juices, or some cooked up especially for the soup, along with chicken stock. You may notice that the the picture has nothing whatsoever to do with soup. That is because I never got a picture of the soup before Little B ate it up. Big D and I each got at least a bowl before Little B at three bowls per meal before it was gone. I substituted soup pictures with a picture Little B took of her lovies (and the leather strip our cat loves killing) after having three bowls of soup for dinner. Enjoy! In a 3 quart stock pot over medium high heat add oil. When oil is hot (in about 30 seconds) add garlic, onion, celery and carrot. Cook, stirring every few minutes until onions become transparent. Add cauliflower, turnip, apple and corn. Stir and continue to cook for about five minutes. Add diced tomatoes with juices, chicken and chicken stock (or chicken juices plus water). Stir in basil, thyme, oregano, parsley and salt. Bring soup to a boil. Reduce heat to low. Cover and let simmer for at least one hour. Taste and add salt and pepper to desired level. Serve immediately or let cool, then store in an air tight container. The other day for lunch Big D wanted cheese soup and Little B wanted vegetable soup. We rarely find a canned soup to our liking, much less wheat free, so if we want it we make it. The good thing is we keep a fridge full of cheese and vegetables. The bad news is I did not feel like being a short order cook, so I came up with a one pot wonder. Seeing that there were about three spoonfuls of leftovers, I think they did not mind the merger I came up with. While the sky outside was spitting a mix of rain and snow we filled our bellies with simple warm goodness from scratch. The beer kept us warm too! In a medium pot over medium high heat add the broth and beer. When it is starting to boil add the broccoli, cauliflower, carrots, tomato, garlic and onion. Cook for about five minutes, until the vegetables start to soften and soup is hot. Add 1/2 cup of cheese, stirring until combined and the soup is hot again (after it got cooled off from adding the cheese). 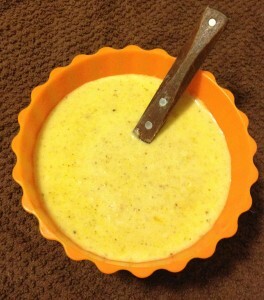 Continue adding and stirring in cheese 1/2 cup at a time and reheating soup in between until it is all incorporated. Add cream and stir to combine. Cover and let simmer on low for about ten minutes. Serve. 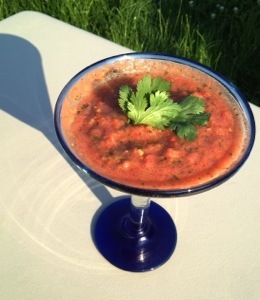 In the past I have talked about gazpacho and tomato artichoke soup, but this one is smoother and just as simple. There is a Little B story behind it. Kid menus in restaurants are horrible, for the most part. Hey kids! Have some wheat bread, some wheat pasta, some breaded stuff and some candy! Oh joy. Just what I want my daughter to consume and ping from for hours. True, there are some places that have good options (some steak houses actually have kid steaks – go figure!). We usually end up ordering vegetable sides or soups for Little B when we eat out. That, or share food we order jointly to share. No problem really, and agreeing on a dish with Little B always comes with negotiations. All of these possibilities work, and heavy reliance on servers who can actually take orders. One of Little B’s favorite restaurant soups is tomato. There are a few places in town that offer it regularly, so she often seeks it out. When we cannot find it we figure something out at the restaurant, then when she still yearns for it, I will whip up a batch of tomato soup at home. I often vary it a bit, depending what is in the fridge, but this is the basic tasty recipe, including bunches of veggies and some cream for fat. She slurps it up and always gives me a big thank you smile. The greatest thing ever. In medium pot over medium-high heat add all ingredients except cream. Cover and cook until bubbly. Stir, reduce heat to low and cover. Simmer for 30 minutes, until onions and celery are soft. Turn off heat and let cool for about ten minutes. Add cream and stir. Using a stick blender puree the soup until smooth. Alternately, put soup in a blender and puree until smooth. Serve immediately, or reheat but do not boil. I like green veggies. Ever since I was a kid I especially liked spinach when the other kids thought ‘yech’! My mom once told me a story about spinach, my brother and I. We went to daycare when we were little, and one day when we came home we would not eat our spinach. Apparently we were told by other kids we were not supposed to like it, so we did not eat it. Talk about peer pressure! We eventually succumbed and joyfully continued to eat it, but we did have the blip. It is still my favorite vegetable, so here is a great soup that includes spinach and made with bits and pieces from the fridge. It turned out savory and filling, which is a wonderful thing. The soup freezes and reheats well, so is a great lunch addition. Another way the soup is helpful is as a supplement. There is a little cafeteria in the building where I work. They don’t have very exciting food, but they make a decent salad. I like the salad but sometimes find it lacking, so I like to bring along some soup to go with the salad. I get to sit in the cafeteria, nuke my soup and slurp it down, along with gnawing on salad, while watching the wind blow or rain fall outside. Simple and relaxing addition to the middle of a hectic day. In large sauce pot melt butter over medium heat. Add garlic and onion, cooking until garlic and onions begin to brown. Add spinach and toss until it wilts and begins to darken, about five minutes. Add beer and simmer until soup is hot. Add cream cheese, heavy cream and Parmesan cheese and stir. Continue cooking until the cheese is melted. 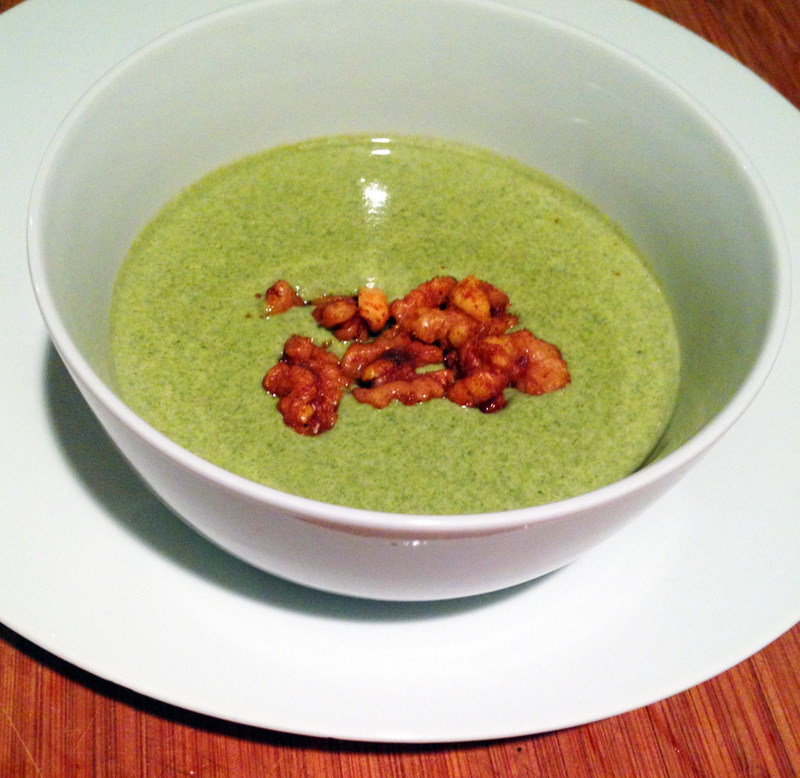 Use a hand blender and puree until spinach is macerated and soup is smooth. Simmer on low for about five minutes. Sprinkle individual servings with nuts and serve immediately. Posole. 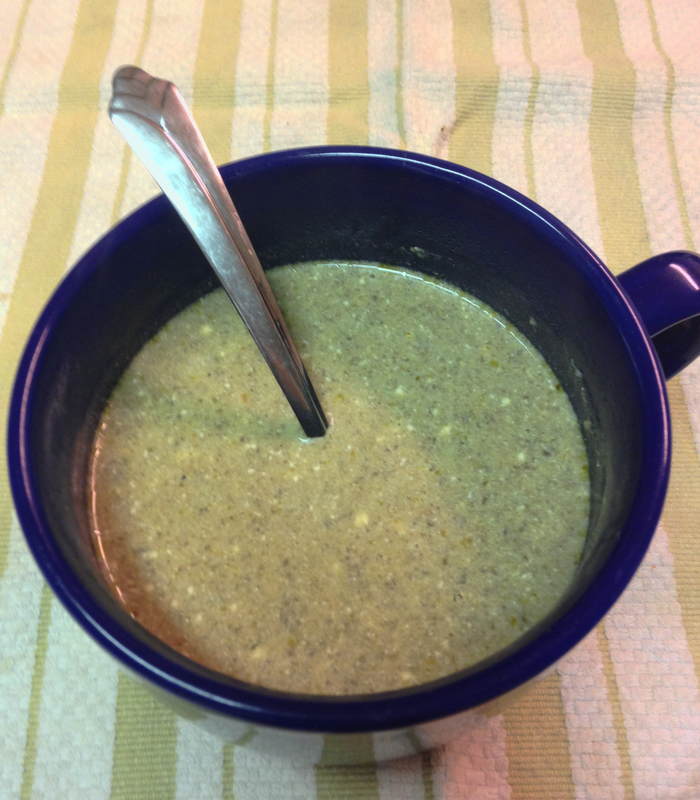 A basic, comforting soup I have enjoyed at restaurants across America that touted Central and South American cuisine. Not having made it before, I dug around to try and identify the when and where of it’s origin. To no avail, I might add. I have most often found it in Mexican and Peruvian restaurants, so then my goal was to figure out the differences between the two versions. I also recently watched a documentary about it being a dish prepared and served in New Mexico hundreds of years ago. Was there a difference? Not much. Peruvian leans more towards tomatillos and green or serrano chiles to give it depth and spice, while the Mexican versions rely on the red chile. New Mexico, of course, relied on their extra special (read Hatch) chiles and local meats. Other variations I discovered switched between the use of pork and chicken. Finally, I decided to come up with my own, since everyone else seems to be doing the very same thing. My goal was to make it similar to the bowl of posole I had in a little, Peruvian restaurant we stumbled upon in a Las Vegas strip mall. No, not on The Strip, but in a mall that is strip like where multiple business share a parking lot. The place was decorated very basically, with varnished plywood walls, folding tables and beat up stackable banquet chairs. The decor accommodated large crowds to watch soccer games or have big parties. We were surrounded by bright posters advertising Peruvian beer, and inundated with loud, quick-paced dance music. The food was amazing and I could only imagine a pre-Colombian Incan family cooking something similar over a fire, in the shadow of Machu Picchu. They may have used alpaca instead of pig, but I am not going there, except in the wearing of a sweater. One thing I love about all my posole experiences is the fresh, raw toppings traditionally served on the side. They give a spark to the otherwise flavorful, yet basic soup. Since I was making the soup for a dinner party I wanted to make sure it was good (duh), and that the topping variety accommodated all the eating habits of guests. I love my friends dearly, but if their diet evolution is anything similar to mine, there is a need for variety in meal preparation. Here is what I came up with, and I must say it was delicious. My dear friends enjoyed it, including Little B. 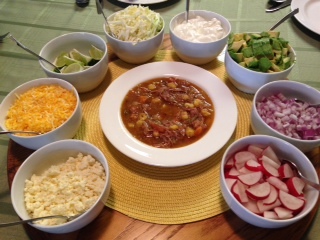 As you can see from the picture, the toppings were many and everyone got to make their own special soup. As usual, the leftovers got better and better a few days later. And as usual, the fun and memories of the people involved in the evening will last even longer. In 8 – 10 quart stock pot place pork shoulder over high heat. Turn shoulder as each side browns, until all sides have color. Add water and scrape bottom of pan to release browning tidbits. Cook pork over medium heat until pork easily shreds, about two hours. Remove pork and liquid from pot and set aside, retaining the liquid separately. When meat is cool enough to handle, shred it into bite-sized pieces. Set heat under the now empty stock pot to medium high and add lard or coconut oil. When it is melted add the onions and garlic. When they start to sweat add the carrots. Add paprika, coriander, oregano and cumin. Stir and cook longer until you can smell the spices. Add broth and beer. Cook until it begins to boil softly. Add pork, hominy, tomatillos and chiles. Stir and cook until a soft boil begins. Taste test to see if you can taste the flavors. If not, sprinkle liberally with salt and stir, then taste again. There should be a difference. if not, add more salt. Turn heat down to simmer, making sure there is still a very soft boil. Cook for an additional two hours. Place toppings in separate bowls with spoons right before serving. 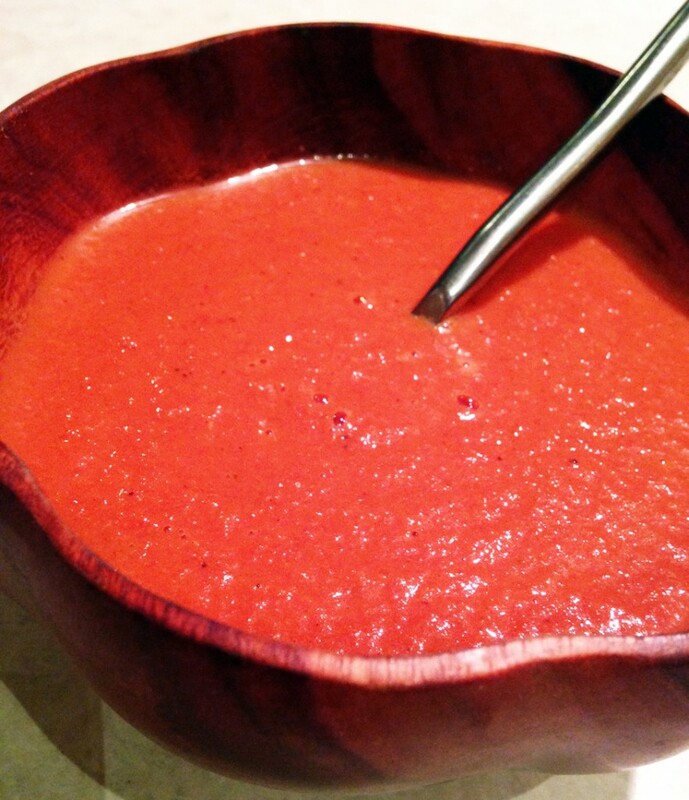 Serve spoon in large soup bowls and pass around the toppings! As the weather cooled in Maryland before we moved, I had an immediate urge to start the making of soup. I am particular about the temperature of my food liquids – cold stuff in warm weather and warm stuff in cold weather. Any other combination just feels wrong to me. I am often made fun of about my idiosyncrasy (insert Big D laughing here), which I believe is pretty common. Am I really alone on this? A hot cup of coffee in the heat of July makes me feel as if I am burning up from the inside. A cold smoothie in December makes me shiver for an hour. 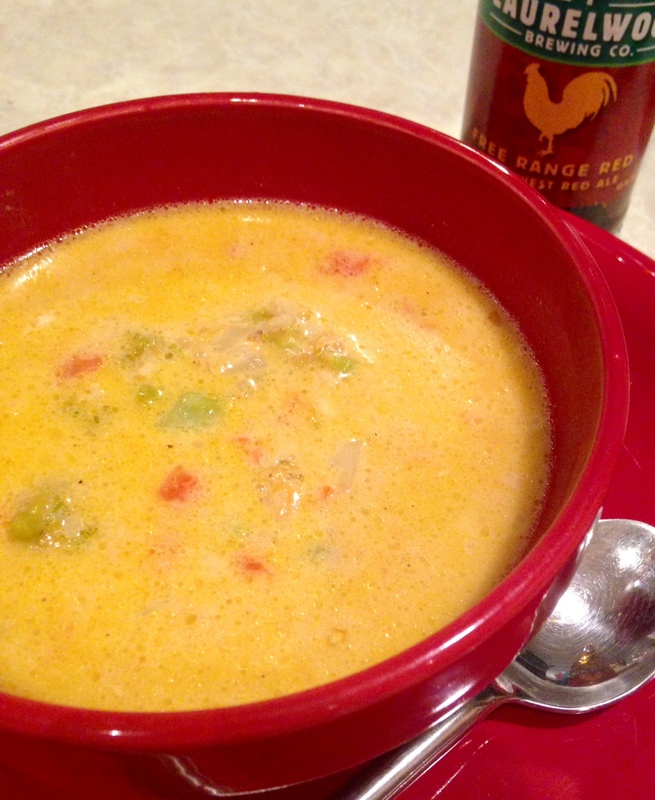 That is why my gazpacho happened in June and iced coffee in July, but then I delved into warm drink mixes in October and here today I offer soup with two of my favorite ingredients – beer and cheese. A challenge I often have when making a liquid dish with cheese is ensuring the cheese is well combined, and is balanced with the liquid. I think I found a good balance here. Your results may vary, but taking time to gradually add and fully incorporate the cheese seems to be the secret. This soup has a strong flavor because of the strong beer, so if you want a more mild soup, then vary the beer, for it will be your guide. And make sure you make it during cooler weather because that is the only reasonable time to eat hot soup, right? In a medium sauce pan combine over medium high heat melt the butter. Add the garlic and onion, cooking until transparent. Add the broccoli and toss, letting it cook for a minute or two. When the broccoli begins to sweat a bit, about two minutes, add the beer. Bring mixture to a boil and turn down temperature to low. Cover and let simmer for about ten minutes, until onion and broccoli is very soft. Remove from heat and let cool for a few minutes, until it is safe to puree. With a stand blender or hand blender in the sauce pan, puree liquid and vegetables until all the pieces are very small and uniform. Return mixture to the stove top over medium high heat and make sure it returns to a boil. When hot, gradually add cheddar and mozzarella cheeses, about 1/3 cup at a time, and stir until each portion is completely melted and combined. After all the cheese is combined, turn down temperature to low and let simmer for about ten minutes, stirring after five minutes. Add the whipping cream and stir some more. If you want the soup smoother, again use the blender to achieve desired smoothness, but remember that it will always be a little bumpy because of the broccoli. Serve immediately, sprinkled with Parmesan cheese. Look at me diving into summery goodness! I am not a real big fan of summer heat, which is only kind of funny, considering I grew up in Texas, where hot and humid are the name of the game for half the year. Maryland has its share of hot and humid, but for only a fraction of the Texas time, thank goodness. 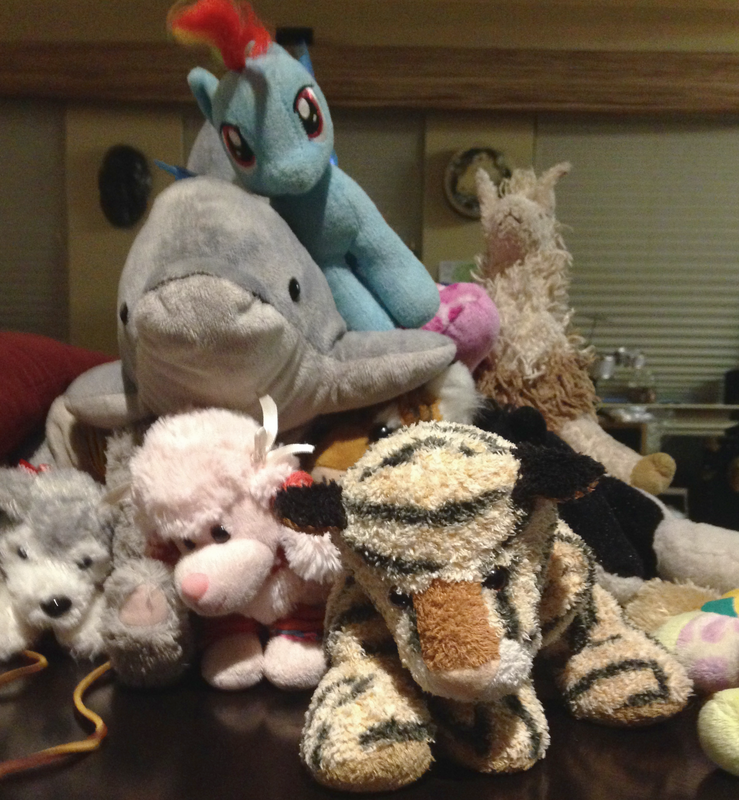 After a particularly rainy week we landed ourselves in the RV for a mostly warm, sunny weekend. Such a weather change inspired me to make a nice, cold soup to go with our fire seared meaty dinner. I stocked up on some fresh vegetables, threw them in a blender and waited, not turning on an oven or firing up a single burner on the stove. The meat got cooked over the fire pit as the sun set, making for a beautiful summer meal at twilight and grand evening of simple, refreshing food. Combine all ingredients except sherry into a blender or food processor. Pulse until combined and all pieces uniform size. Add 1/8 cup sherry and pulse again to combine. If you like chunkier soup like me don’t pulse further. For smoother soup, continue pulsing to desired texture. Depending on the sweetness of the tomatoes and onion you may need more sherry and/or salt. If you are not sure, chill soup for about an hour and taste before deciding to add more. Chill at least two hours or overnight before serving. Garnish individual servings with any combination of tomato/cucumber/bell pepper/herbs you wish. Little B loves vegetable soup. I also consider her a whippersnapper. The traditional definition of the term refers to an insignificant or impertinent young person. Such a definition is not what I think of when I use the word. I think it more describes a precocious, inquisitive little one, which is much more in line with Little B’s personality. Her precociousness carries over to her view of soup. Whether it is actually chicken soup or tortilla soup or beef stew, she considers it vegetable soup. Pretty reasonable, I think, since most soup she has seen is loaded with vegetables. Big D and I like soup, too, especially if it has a bit of a spicy bite. I particularly like the limy chicken soup I make on occasion. Our ‘big people’ soup does not always go over well with Little B because her tongue is not yet attuned to hot spicy. I have never served Little B canned soup. I am sure someone has, but canned soup worries me. With the odd, faded colors of the vegetables and the grainy feel of the meat they are a bit unsettling to me. Don’t get me wrong – I grew up on Campbell’s Chicken Noodle Soup and still sometimes crave the salty soft noodles and bright yellow tinge of the broth. I don’t think they taste bad, except for the saltiness of some types, but I like to know where my food comes from, and I feel the same for what Little B eats. My know-where-it-comes-from parameters are certainly not met by canned soup. This soup recipe is simple to throw together and freezes well. I make it regularly, with a variation on the vegetables I add, depending on what is in the fridge. Little B eats three or four bowls a week, often when Big D and I eat spicy food. She even has it for breakfast sometimes. Frozen in two to three cups per resealable bag or container is perfect – enough to have in the fridge when requested without any going bad. Our whippersnapper loves it and it is so good for her. 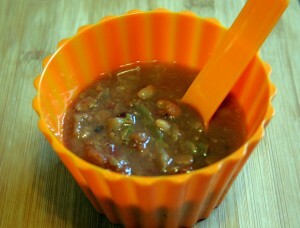 In stock pot or crock pot combine bean soup mix, tomatoes, celery, green beans, cabbage, onion, ham (optional) and broth. Add garlic, oregano, salt and cumin. Stir until spices are combined. Add water and stir a bit more. On the stove top bring soup to a boil then turn down to simmer. Cover and simmer for about four hours until beans and vegetables are soft. In a crock pot, set to low and cook for eight to twelve hours. Serve immediately or store in the freezer for up to three months.